Every year, one and a half million collisions with deer kill close to 150 people and cause more than $1 billion in vehicle damage. 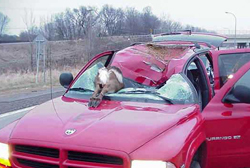 Most collisions happen in the fall, when deer are in the rut or mating season. The odds of colliding with a deer this season for a Wisconsin resident is 1 in 97 - the state of Wisconsin has the 7th highest deer-incident rates nationwide. Wisconsin residents, contact a knowledgebroker to review your current policy, get a free quote and improve your coverage.